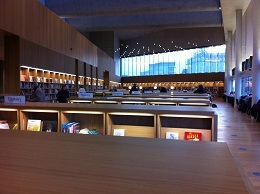 I first visited the LexIcon Library & Cultural Centre in Dun Laoghaire in January this year. This was just a few weeks after it had opened its shiny new doors to the public. First impressions were mixed, but I’ll come back to that. I was a supporter of the library from day one, despite the public backlash and attention grabbing headlines about cost and controversy. Yes it reportedly cost €36.3million. Yes it was spent on a library. It was years and years in the planning. The competition for the architect was awarded in 2007, it opened its doors some 7 years later. This was a mega project. This was the result of an inspired vision. Overheard conversations on the DART train line raised concerns over the seafront façade and how the building might fit in. However it fits right in. Big buildings need big ideas, big budgets and bold plans. The bold plan paid off and just 9 months later the library has led to a rebirth of Dun Laoghaire. The place, the peacefulness, the public access and the possibilities that the library brings are on offer to all. I’m writing this because I’d like to encourage people to visit it. If you haven’t already, take a half day off work, make an evening visit or go at the weekend. If you have children or teenagers, bring them. If you have aged parents, bring them. If you have a visitors staying, recommend it to them. If you have a disabled friend or relative, encourage them to go. Public libraries capture the essence of democracy. This brings me back to my initial mixed feelings. My worry was the wholly democratic nature of the library meant it was open to the masses, and I speculated over how it might be treated. On that cold rainy day in January, it was wide open to the public, it was a brand new place that many people had come to explore who may never step foot in it again, or who may have just passed through to see and be seen. It was the place to be. Yes we know public libraries are not exactly trendy, but the LexIcon was and is pretty trendy. That Saturday afternoon in January at about 4pm, the library was alive. It was packed, not crowded, but full. I entered the library at ground zero with a sign showing the promise of a ‘café coming soon’. 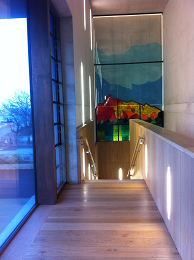 The steps lead up to a staircase welcoming visitors with an impressive 5.5 metre high stained glass artwork by an Irish artist, Katharine Lamb. I walked up the stairs to the first floor where there was a hum of activity and the noise increased with every mounting step. There are wide open spaces, an art exhibition, rooms with spectacular views of Dublin bay, these views are now open to everyone, not just the Bonos and the Louis Walshes of this world. It is a pleasure to pause in awe at the natural beauty of the bay. The vista is breathtaking, matching some of the best scenic seascapes in the world especially on a summer’s day. I paused at a room where boys were playing an intense game of chess, other rooms were empty with lingering hints of recent activity. The second floor reminds the visitor that the building is in fact a library, with people sitting in rows reading, huddling, talking, browsing. The technology is impressive. Laptops are available for loan and computers are plentiful. What struck me was the number of teenagers sitting at tables, some with paperbacks, others scribbling notes, others tuned into a virtual environment with headphones on and smartphones aplenty. Involving young people in the design and space of a library is key to getting them to feel a type of ownership over the place and become invested in it. Having dedicated areas that appeal to teenagers has been shown to encourage library use and has been highlighted by several Government reports about public libraries in Ireland (Department of the Environment and Local Government (2008) & McGrath et al. (2010)). The LexIcon clearly appeals to teenagers. The attention to detail here is commendable. The library staff have listened to the voice of the customer. More than that they have involved them and enabled them to participate. The designs of the cushion covers that sit on the soft furnishings in the children’s and young people’s section were designed by local children. 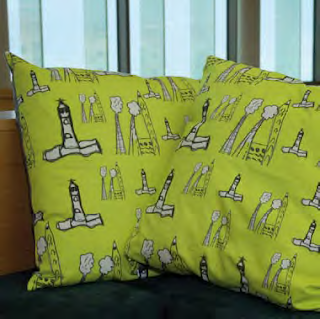 A local artist brought the children to the seafront and surrounds of the library and they were inspired by the environment which led to the colourful designs. What a novel idea. The bookshelves are low in the centre, leaving wide open views into the distance of space and the sea beyond. Books are arranged sparingly with some empty gaps where books should be, but perhaps are in use. There is a strong local history section, in fact a floor is dedicated to it. There are talking books, DVDs, all the usual stock picks from the traditional public library on display. Self-service is available on every floor with queues forming. There is a toddler/wobbler area on level 2 and you’d be forgiven for thinking you had walked into a crèche, for this is how it feels. I’m not giving out. I’m just saying if you want peace and quiet, go straight to the top floor. The top floor is a kind of reader’s paradise. A place of sanctuary, a shelter from the cold Irish sea winds outside. A place to just be. What worried me on my first visit was the apparent scarcity of library staff. The few I had seen appeared ruddy faced, stressed and slightly overwhelmed. The people appeared to be in charge. The people were raising or lowering the tone, depending on one’s perspective. It is a building for the people who must make of it what they will. But make no mistake, it is theirs, it is ours. I hoped that it would be cared for and receives the respect that it deserves. Having visited several times since then, all seems to be well. I didn’t just return to check out the ground floor coffee shop either. Whoever is in charge of curation and of events at the LexIcon is doing a top job. The exhibitions, the galleries, the writers, the events are first class. There has been a Matisse art exhibition, Father Browne’s ‘Life Through a Lens’ photographic exhibition, creative writing with Colm Keegan, a beautiful outdoor photo exhibition celebrating unique personalities of Down Syndrome children in Ireland and a summer garden party. Librarians from other sectors could stand to gain a lot from the event management and professionalism involved in the offerings by public libraries in general. They are the event managers extraordinaire. They are doing a good job at social media and their Twitter account is active. If anyone wants to find out what’s on, follow the @DLR_Libraries account. Like many other public libraries in Ireland, they have embraced Twitter in a big way, with strong engagement with stakeholders including local communities and councillors. Many public libraries have events on for culture night which is a national celebration of culture, creativity and the arts. This special event takes place annually giving the public have open and extended access to cultural institutions with all events made freely available. The LexIcon is a place to visit, to sit, to browse, to read, to stand, to relax. It’s a place to take in the views, to breathe in the sanctity. The LexIcon has brought new life to a new place in Dun Laoghaire. It’s free, it’s open for all and it is inspired. I attended the AGM of the Academic & Special Libraries section of the LAI in June this year. Marian Keyes, senior executive librarian from the LexIcon spoke with passion about the project. Of course, there were ups and downs along the way, but mainly it has been a hugely positive development for libraries and most importantly for the community. Public libraries are being brought under fire in many countries, particularly across the water, in the U.K. The situation is so bad that a website was set up to keep an eye on the closures and track threats. Since 2009/10 some 357 libraries have closed with more under threat of closure. I’m not naïve enough to think that all libraries should stay open no matter what, but this rate of decimation has to act as a serious wake-up call to all librarians, not just public ones. In Ireland there has been a long gap in recruitment to public library posts, with very few positions advertised as new graduates know only too well. The LexIcon didn’t happen overnight, nor did any other big public library project in the country. It takes vision, resilience and a fidelity to implementation for success to happen. Luckily we have leaders in libraries. I remember as an LIS student in 1997 conducting an interview with Fingal County Council’s then county librarian Mr. Paul Harris (retired in 2009). He struck me as a man with a plan. A plan for what was to become the then biggest public library in the country, which opened a few years later in Blanchardstown in 2001. 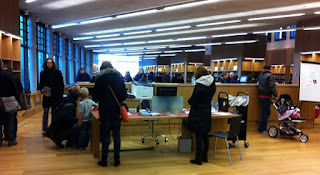 The library is another fine example of an embedded public library. It is embedded into the community, easily accessible to Blanchardstown’s key attraction, its shopping centre, and sharing an entrance foyer with a cultural outlet, the Draiocht theatre. For most public libraries, location is everything. Whilst in the planning Paul had many obstacles to overcome, including having an answer to the question “How can we justify spending this amount on a library?” People thought the plan was far-fetched, over-ambitious and impossible. People said he was basically mad. But perseverance won the day and again, a clear vision for the future of the public library meeting the needs of an evolving community. Paul had taken a research approach to the project. He looked at the data for the shopping centre, at the time (from memory) it was attracting a million shoppers a month, just after a year of being open. This data provided a ready made readership for the new library. It was a plan that paid off and now the library is another key attraction for Blanchardstown with over 113,498 registered members in 2011(Public Library Authority Statistics, 2011). Of course there are other great examples of public libraries throughout Ireland but I’ve just highlighted two. As librarians we must continue to support each other, to network, to learn from our mistakes, to build on our successes and most of all to share all of our learning with each other. There needs to be cross-fertilization of ideas amongst the different sectors of librarianship, from special to academic, from public to school, from health to legal to corporate. Our combined experience will drive librarianship forward. Public libraries are on the brink of a new era. They are experimenting with new ideas and making brave choices. A major development in Ireland is the introduction of a joint public library system. The first phase includes an online catalogue currently available in Fingal Libraries, libraries in Dublin City, Dún laoghaire-Rathdown, Kildare, South Dublin and Wexford. Another interesting idea is that all public libraries will share a common brand. According to the latest “Strategy for Public Libraries 2013-2017” “Local authorities will agree a universal library brand based on an agreed core service, available to every library and promoted nationally” (p.46). Libraries have always been open to co-operation. This is emphasized as one of the 7 strategic priorities of the plan under the heading ‘Cooperation, Partnership & Promotion’. They need our support. Let’s lend it. One way to do this is to be positive about public libraries, obviously within reason. We can’t ignore that there may be staffing issues and funding obstacles, but it is important to focus on the good work being done and the unique value proposition that public libraries offer their communities. Nick Poole Chief Executive of CILIP has emphasised the need to change the negative narrative around public libraries and start promoting the positive. He questions “Why would anyone want to invest in a service that sounds like it’s failing?” (CILIP Update, Sept 2015 p.30). I’d have to agree. 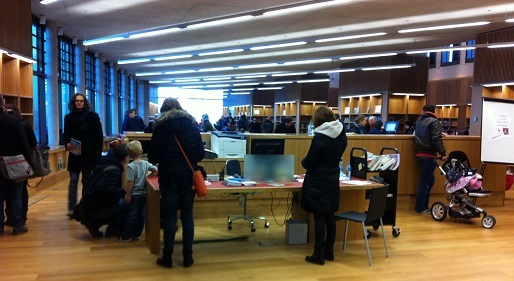 Dun Laoghaire’s LexIcon is a public library success story. The public librarians are doing a good job. Let’s help spread the word.